Sports, with all its adrenaline driven passion, can go from being a great source of entertainment to a matter of life and death in seconds. From more extreme ones that entail jumping off cliffs, to more common one that comprises of throwing a ball around, the rate of injury and fatality in sports is incredibly high. 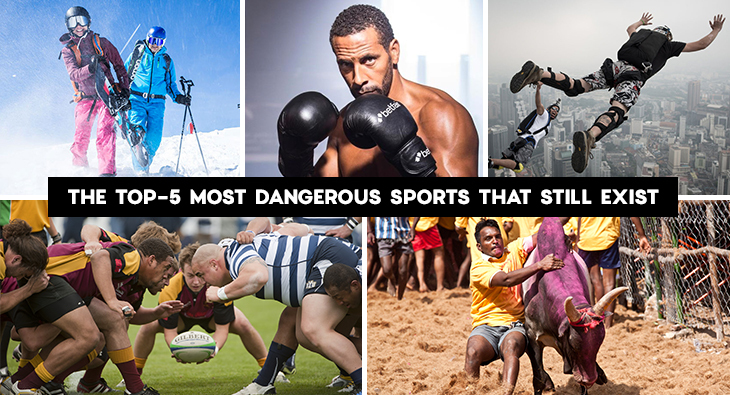 Most sports have an element of risk to it, so let’s take a look at some of the most dangerous ones. With the sole aim being to knock the daylights out your opponent, boxing, unsurprisingly, is on this list. Although the injury rate in boxing is slightly lower when compared to other combat sports like MMA, the severity of injuries is much more acute, mostly due to focus on blows to the head. Research shows that sports are associated with brain damage caused by repeated head trauma, with a 90% prevalence rate. The symptoms of CTE are worse in boxers than in other contact sports. Any sport that involves massive, angry, muscle-packed beasts with horns that could pierce your heart would make you wonder why anyone would even bother to take the risk, but bull taming sports exist all around the world. Bull riding, for example, entails staying mounted on an enormous 1000 kilo bucking bull for as long as possible. Similarly, Jallikattu is an ancient, controversial sport practiced in Tamil Nadu, India. The participant grabs on the bull’s hump, tail or horns, and attempts to stay on for as long as they can “taming” the bull in the process, with no safety equipment whatsoever. Both are associated with a high risk of head, face and neck injuries, and even death. 30 burly men smashing into each other with minimal protection for almost an hour doesn’t sound remotely safe. Rough collisions and tackles have led to the deaths of some players, and the sheer brutality involved make dislocations, concussions and broken bones a standard part of the game. Regarding the risk of death, base jumping is high up there. Entailing jumping off heights of over 15,000 feet and hurling towards the earth at a breakneck speed of hundreds of miles per hour, one small mistake can spell death for even the most experienced. One can either land safely or smash into the solid ground. Skiing itself has a reputation for being a dangerous sport. Dangerous speeds with added obstacles like trees and rocks, extreme weather, and the danger of avalanches already make the sport a perilous one. Add a helicopter to the mix, and you’ve amped up the risk level. Helicopters are used to access off a trail, untouched downhill paths that would satisfy ant thrill seeker.